Home » A Consumer Guide to Solar Panels in 2019 » Can I build my own solar panel system? It is possible to build and install your own solar powered panel system, and often the cost of doing so would be much lower compared with the prices charged by professional solar panel installers. Do you want to earn money from the FiT? The crucial thing to bear in mind, however, is that DIY installs are not immediately eligible for Feed-in Tariff payments, which for many people are the principal attraction of PV systems. In order to be eligible for FiT payments (both generation and export tariffs), every installation must secure government-approved Microgeneration Certification Scheme (MCS) certification. This certification must be carried out by an MCS-accredited engineer, who ensures that quality and safety standards are met. Certain MCS-accredited engineers may be willing to certify your DIY solar panel installation, although most will be reluctant or refuse to certify a system that they didn’t install themselves. There may also be issues surrounding insurance and mortgages if you chose to install a pv system yourself. You could find the process complicates matters when and if you chose to sell your property (because you wont have the relevant MCS cretification paperwork associated with connecting your PV system to the mains / national grid power). 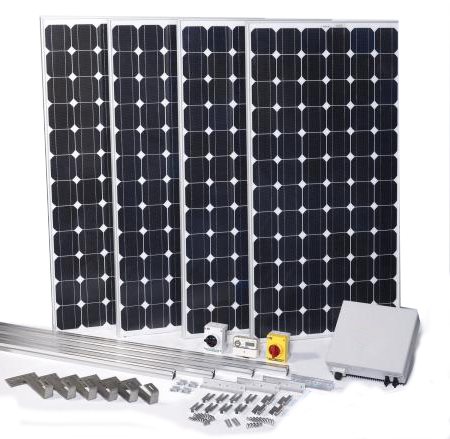 Some companies offer Solar DIY kits, which include all of the necessary hardware (solar modules, inverter, generation meter, brackets, cabling etc). In order to be qualify for FiTs, however, the project will need to be administered by an MCS-accredited tradesperson, and the total cost of this option may not be much less than the cost of a full installation by a solar company. Building and installing grid solar power panels yourself is still a viable option if you plan on using all of the energy produced by your solar panel system or if your property is off the grid, although the financial rewards will be significantly lower given the lack of the FiT generation and export tariffs.